BREAKING: The Las Vegas sheriff believes gunman Stephen Paddock did not act alone and had to have an accomplice. Mr Lombardo’s frank comments put into doubt explanation previously put forward by authorities that he was a “lone wolf”. 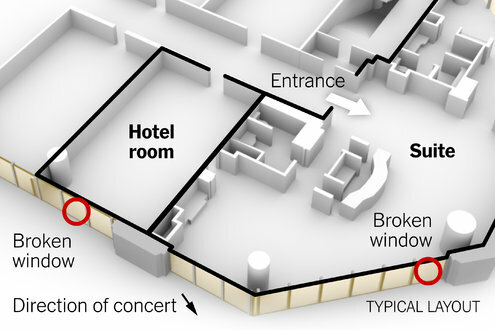 Before he mowed down concertgoers from a perch high in a hotel tower, Stephen C. Paddock created a ring of surveillance around him, with video cameras in his suite and in the hallway, law enforcement officials said on Tuesday. But investigators were still at a loss to offer a motive for the massacre. The cameras — apparently intended to warn of approaching threats — along with the 23 guns, hundreds of rounds of ammunition, and other equipment found in the gunman’s hotel suite, suggested a thought-out plan to have plenty of time to wreak carnage while holding the police at bay. Local and federal investigators were also eager to interview the gunman’s girlfriend, Marilou Danley, who had been in the Philippines. She arrived at Los Angeles International Airport on Tuesday night and was met by the authorities, according to a law enforcement official. Sheriff Joseph Lombardo of the Las Vegas Metropolitan Police Department said that at a minimum, she might shed some light on what was going through the mind of the gunman, who killed himself as the police prepared to enter his room. Twelve of the rifles Mr. Paddock had in his luxury suite on the 32nd floor of the Mandalay Bay Resort and Casino were outfitted with a “bump stock,” a device that enables a gun to fire hundreds of rounds per minute, like a machine gun, which may explain how he was able to rain such devastation on the crowd below, law enforcement officials said. Such devices are generally legal, and the possibility that he may have used them set off a fresh round of calls by Democratic lawmakers in Washington to pass more gun regulations after the tragedy. At 10:07 p.m. on Sunday, the gunman opened fire on the thousands of people attending a country music festival a few hundred yards northeast of the hotel, firing long, rapid-fire bursts as people screamed and ran for their lives. He killed 59 people — the coroner clarified on Tuesday that the number included Mr. Paddock, along with his 58 victims — and wounded hundreds of others. In all, more than 500 people were injured, most by gunfire, and some in the panicked rush to escape. President Trump, who is expected to visit Las Vegas on Wednesday, said on Tuesday that Mr. Paddock was “a sick man, a demented man,” adding that “we are dealing with a very, very sick individual.” He said there would be some discussion about firearms legislation, but was not specific. Police officials said that Mr. Paddock, 64, had set up two cameras in the hallway, including one on a service cart, and a third camera over the suite door peephole. “I anticipate he was looking for anybody coming to take him into custody,” the sheriff said. According to a law enforcement official who was not authorized to discuss the matter publicly and spoke on the condition of anonymity, investigators also were looking into whether Mr. Paddock had planned an earlier attack in Las Vegas before deciding to target the concert Sunday night. Mr. Paddock checked in on Thursday and kept the “Do Not Disturb” sign on his door for the next three days, so no maids entered the rooms, according to a hotel worker, who also was not authorized to discuss the matter. Housekeepers are allowed to enter a room with such a sign only in the presence of a security guard, and it happens rarely, usually after several days, the worker said. The hotel staff is trained to look for anything suspicious, but the gunman’s behavior did not set off any alarms, the employee said. He had at least 10 suitcases in his room, the sheriff had said, which might have been used to bring the guns in without notice. But the hotel worker said it would have been easy to bring them to the room a few at a time without arousing suspicion. 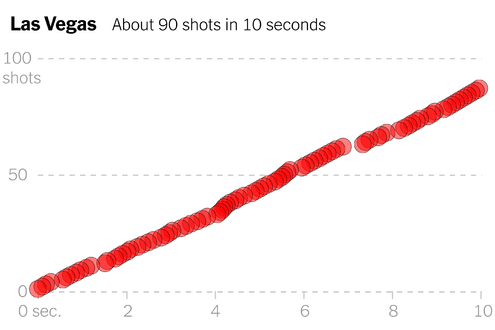 Semiautomatic rifles, like those the gunman had, are made to fire a single round with each pull of the trigger. But recordings and witness accounts of the shooting made clear that Mr. Paddock was firing much faster, at a rate comparable to that of a fully automatic weapon, which quickly fires round after round with a single pull of the finger. Undersheriff Kevin McMahill of the Las Vegas police said that Mr. Paddock fired on the concertgoers for nine to 11 minutes, in about a dozen bursts. Replacing the standard rifle stock, which rests against the user’s shoulder, with a bump stock like the ones Mr. Paddock had, allows a semiautomatic rifle to fire much more rapidly, like an automatic, firing hundreds of rounds per minute. The devices are usually legal and inexpensive, with some versions advertised for $99. A bump stock allows the body of the rifle to slide a short distance back and forth, harnessing the recoil energy of each shot. The weapon bounces, or “bumps,” rapidly between shoulder and finger, essentially creating the action of repeated trigger pulls without the gunman having to move the trigger finger. Senator Dianne Feinstein of California, a Democrat, has called for years for a ban on bump stocks, and she renewed that call on Tuesday, writing on Facebook, “This is the least we should do.” Congressional Democrats asked their Republican counterparts to establish a special committee to investigate gun violence. Senator Mitch McConnell, the Republican majority leader, rebuffed questions about potential legislative action during his regular news conference Tuesday afternoon, saying that the massacre was being politicized. Senator John Thune, the third-ranking Republican in the Senate, told an NBC News reporter that lawmakers “ought to take a look at” conversion kits that can make guns more lethal. But Mr. Thune also suggested little could be achieved through legislation. Mr. Paddock was an avid gambler who often bet heavily at the major casino hotels, and Ms. Danley, 62, had worked for some of those hotels. 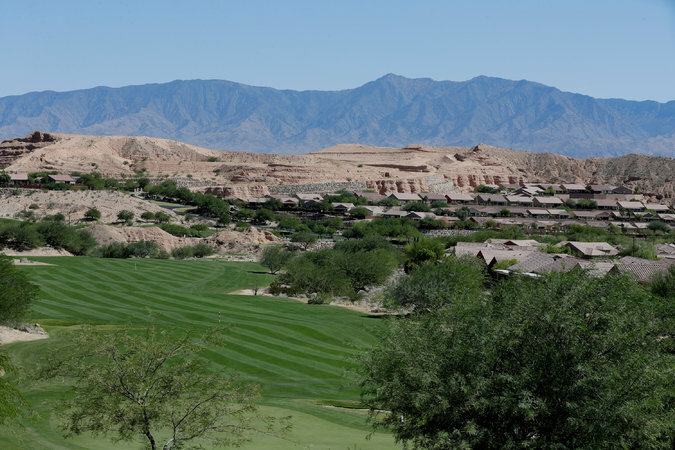 They lived in Mesquite, Nev., 80 miles northeast of Las Vegas, and he also owned a home in Reno. The police have found a total of 47 firearms in his two houses and his hotel suite. Jill A. Snyder, the special agent in charge of the San Francisco office of the federal Bureau of Alcohol, Tobacco, Firearms and Explosives, said that almost all had been traced, and that they had been bought in Nevada, Utah, California and Texas. 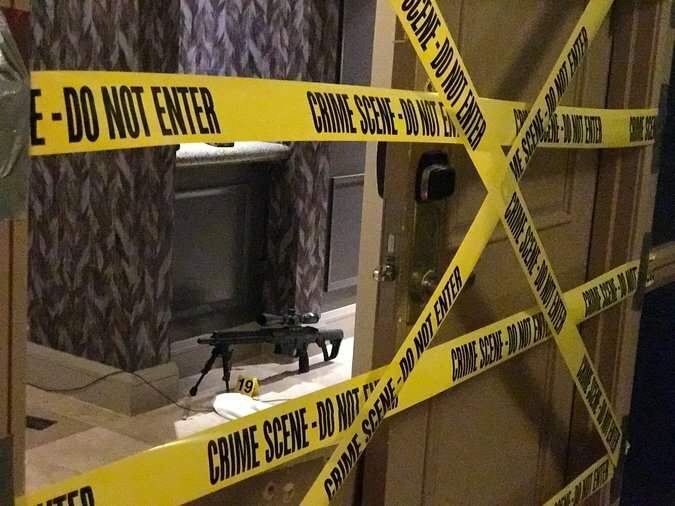 Leaked photos that showed parts of the scene inside and outside the hotel suite, including Mr. Paddock’s body, his rifles and spent ammunition shells on the floor, began circulating online Tuesday. “What I can tell you is I’m very troubled by it,” Sheriff Lombardo said of the leaks, which his agency was investigating. The police did release a video, a compilation of footage from officers’ body cameras, showing the chaos as Mr. Paddock began firing on the crowd. Amid confusion about where the blasts were coming from, some people rebuffed requests to evacuate. “That’s fireworks!” one shouted at officers. Another yelled expletives. “North of the Mandalay Bay, it’s coming out of a window!” another officer said.